President Obama's Monday address to the nation about Libya ended at 7:57 PM ET. By 8:05 PM, CNN's Nic Robertson was reporting to Anderson Cooper from Tripoli that the Libyan opposition battling Moammar Gadhafi is deeply divided in their view of the International Coalition's intervention on their behalf, with one side believing that the intervention represents an attempt to split the country in order to steal Libyan oil. I have no idea how that side came to such a ridiculous idea. But moving along, yesterday U.S. Secretary of State Hillary Clinton was in London on a cat-herding mission for President Obama, who is rather desperately trying to persuade the International Coalition to think and speak in one voice on the matter of Libya. Desperation would be an understatement on account of Obama's advisory bench being heavy on Arab affairs advisors and light on African affairs advisors. What this means is that Obama didn't realize at first that (a) Gadhafi thinks like an African, (b) Gadhafi plays the archetypical role of the African chief, and (c) many Africans think like Africans. What (c) boils down to, in terms of the situation at hand, is that in the view of many Libyans you give the chief the shirt off your back no matter how much he abuses you and the stronger the chief the less you complain about the abuse. That's the way things are in Africa. That's the way things have been in Africa for countless millennia, on the theory that new-fangled ideas of government come and go while a strong father's will to protect his children is eternal. Will this theory eventually die out? Will the Libyan opposition on the other side of the split, with leaders educated in the USA and Europe, and including a wafer-thin stratum of democracy activists, someday prevail over the atavistic African model of the most reliable form of government? One would hope so, but right now the President of the United States is facing the stark prospect that not only might Gadhafi survive the International Coalition's onslaught but also that any support Gadhafi receives in Libya could further fracture the Coalition, which is already at loggerheads on how to proceed. But when one notes that many Africans (a) consider the Arab Spring an Arab thing (b) still think of the Arabs in Africa as conquerors and colonialists, and (c) have never stopped fuming about European colonial adventures in Libya, I'm afraid that appeals to humanitarianism play better in the United States than where it counts. None of the above goes near addressing the problem I mentioned in the last post, which is that the 'cooperative' side of the Libyan opposition -- the side that welcomes Coalition intervention against Gadhafi -- has elements that are sympathetic to America's enemies. Top of the enemies list is al Qaeda. Now, we saw regime forces on the outskirts of [Benghazi]. We knew that if we waited one more day, Benghazi –- a city nearly the size of Charlotte –- could suffer a massacre that would have reverberated across the region and stained the conscience of the world. As I noted in the March 15 post, Gadhafi had no intention of launching a massacre in Benghazi, which would have been counterproductive for his purposes. His plan was to partly encircle the city, then use a variety of measures to encourage and pressure the Benghazis to drive the rebel leaders through the opening in the circle, out into the desert, where he intended to pick off the leaders. So this was going to be a waiting game, not an invasion. A massacre would have driven thousands of additional refugees across Libya’s borders, putting enormous strains on the peaceful -– yet fragile -– transitions in Egypt and Tunisia. The democratic impulses that are dawning across the region would be eclipsed by the darkest form of dictatorship, as repressive leaders concluded that violence is the best strategy to cling to power. The writ of the UN Security Council would have been shown to be little more than empty words, crippling its future credibility to uphold global peace and security. So while I will never minimize the costs involved in military action, I am convinced that a failure to act in Libya would have carried a far greater price for America. Yes, the refugee problem is considerable. On Monday CNN correspondent Ivan Watson reported that refugees from Libya had been flooding into Tunisia and Egypt at the rate of 15,000 per day. That the flood had been stanched somewhat since the Coalition took military action didn't mean an end to the humanitarian crisis created by the refugees. And yet the price of all that for America can't be counted because right now there is no limit to the cost of blinkered U.S. initiatives to bring about democratic reform in Egypt; that's because the sky's the limit for the unintended consequences. If you ask what initiatives I'm talking about -- I forgot to mention that part, perhaps because of embarrassment that I led myself down the garden path after I read a Wikileaks leaked State Department cable about Egypt that the (U.K.) Telegraph published on January 28. You remember that cable; right? I discussed it in the February 14 post in which I contended that under cover of 'peaceful' protests Egypt's military had launched a successful coup to remove Gamal Mubarak and the Gamalists from power. Ukraine, traditionally passive in its politics, has been mobilised by the young democracy activists and will never be the same again. But while the gains of the orange-bedecked "chestnut revolution" are Ukraine's, the campaign is an American creation, a sophisticated and brilliantly conceived exercise in western branding and mass marketing that, in four countries in four years, has been used to try to salvage rigged elections and topple unsavoury regimes. So, again, because there's no way to factor in the unintended consequences at this point there's no way to even estimate the cost to taxpayers who'll be stuck with the bill for putting Libya back together into some semblance of order. Technically, the Gadhafi assets frozen by UN mandate should cover the costs for Libya, but those can't be disbursed immediately and immediately is what's needed. As to the cost in human lives and wrecked economies to -- again, there's no way to tell at this point how much it will add up to. Of a $150 million Egyptian "transition fund" announced by Washington, $50 million will go toward democracy and governance programs like the ones that have nurtured hundreds of Egypt's rising democrats, The Associated Press has learned. That would triple the 2011 funding previously planned. "We need more support, and fast," said Abdallah Helmy, 34, co-founder of Egypt's dissident Reform and Development Party and one who benefited in recent years from "hundreds and hundreds of hours" of U.S.-supported training in everything from managing campaigns and elections to using Twitter, Facebook and other social media for political messaging. Those are all wonderful projects. Pity they wouldn't be worth much in a country where the military cut a deal with the Muslim Brotherhood in exchange for the Brothers' help in ousting Gamal Mubarak. The March 24 New York Times report that discusses speculation about such a deal doesn't mention the part about a coup; to my knowledge the Times hasn't entertained the possibility that a coup happened. Anyhow the Times report came too late to warn Egypt's secular democracy activists who were engaged in the protests -- although I seem to recall that John Batchelor warned during the early days of the Egyptian protests that the Brothers and the military had cut a deal, and repeated the warning more than once on his show and his blog. Yet within days of Hosni Mubarak's departure from office, and without prompting from outsiders, many secular Egyptians who took part in the protests did become suspicious that they'd been duped by the military and even some of their leaders; unfolding events in Egypt have not eased their suspicions. In short, it's going to take huge infusions of cash and technical help if Egypt's genuine democracy advocates are to have even a ghost of chance against a coalition of the military's old guard, the Muslim Brotherhood, and the most radical of Egypt's conservative organizations. To argue that establishing a genuine democracy is always a rocky road would be to ignore or overlook that it would have been impossible for the military to stage a bloodless coup in Egypt without the assistance of the Western-trained democracy activists who planned and led the initial protests. That the activists might have been innocent dupes wouldn't change the fact that democracy activism, as taught and funded by Western organizations, made it possible for Egypt's military to palm a coup in full view of the world. If you want to argue that there was no coup I'll be glad to debate you on that score, and I'll do it in a Note at the end of this post. For now, the point is that the more players involved in democracy-promotion initiatives that are mounted or supported by foreign governments, the harder it becomes to monitor them all and control how they're used, and where the funds actually end up. It all started with the best of intentions, in the 1980s, with the establishment of the National Endowment for Democracy to promote democracy around the world. Its activities were to be closely monitored by Congress because even though it was a private organization it would receive federal funding. The idea worked so well that others started copying it. Not in a year or two but over decades a thick forest of NGOs, GONGOs (government-sponsored non-governmental organizations) and INGOs (international GONGOs) grew up. The idea became attractive to all kinds of players, not all of them interested in democracy. But set aside democracy initiatives that are fronts for lobbies only interested in business deals or in manipulating a country's politics; set aside local crooks and transnational criminal gangs that set up phony NGOs to cover their tracks. I'm talking about what happened when the sincere democracy-promotion organizations morphed into a kind of industry -- a completely unregulated one. Les Campbell spoke of the "many, many entry points in many centers of power," in America and called this a beautiful system even though it could produce conflicting policies. But when the unintended consequences arising from the activities of thousands of people scattered across hundreds of organizations, agencies and departments that operate out of sight of the American voter and often in conflict or with no coordination and official mandate suddenly manifest in the screaming headlines of crisis, what then of the beautiful system? Hillary Rodham Clinton remark at London [summit], "... to achieve their aspirations through political change ..." is the blandest way of describing what begins now as years of manipulation and misdirection by the Euro colonial powers to secure the energy fields of Libya without looking as if they are running 6 million people as feudal tenants. The obstacle to this utopian fairy tale is Q [Gadhafi]. Am told Q is looking at exile and sniffing, 'What about Charles Taylor, oh great Uncle Sugar?' You promised him safe exile in Nigeria if he'd depart his Monrovia nest; however, as soon as the Liberian gov changed hands and decided that Taylor was an outlaw (guided by the geniuses at George Bush State) the ICC closed in and Chuck T sits in the Hague playing video games and hiding his money. Q knows the ICC is the threat, and he does not believe State. Also, the rebels are a nightmare of stooges and regime plants. Also the rebel soldiers are all featured on Al Q jihadist websites as heroes of Iraq and Afghanistan. Guys we used to chase we are now protecting with air. Laughter is a useful emotional release for the You Can't Make This Stuff Up planet of chuckleheads and deadbeats called Earth. Final note: the deep conflict in London is that Pop Q wants Saif Q to take command of apparatus at Tripoli and run election which he will win overwhelmingly. The Benghazi TNC, stooges all with Western educations and Euro bank accounts, reject this Son-for-Dad deal as the end of their days. Pop the popcorn, as the Italians and Turks love the deal, and the US and French hate it. Who, then, is the victim in all this madness? For a headless horseman must always have a victim. The victim is America's most cherished values, which Barack Obama spoke with great feeling about during his address to the nation about Libya. My analysis, the one I published on the 14th, had gone much further than Hendawi and Friedman; I'd concluded that a cadre in the military's high command (the 'Old Guard') had used youth groups to stage protests that masked a coup, which was aimed at routing not Hosni but Gamal and Gamal's closest associates. Friedman had emphasized the military's struggle against Gamal, which was heating up as Egypt's 2011 presidential election drew near. Yet Friedman was willing to assume that despite their desperation the military's Old Guard would simply wait and hope for a serendipitious moment to give them an opportunity to oust Gamal. The Old Guard was in no position to wait and hope. Ironically, a February 16 report from STRATFOR titled Egypt's Next Crisis: The Economy, aided my argument. The report, which was republished by the Market Oracle website, throws vastly more light on the Old Guard's reasons for wanting to oust Gamal than even the reports I'd used as the basis for my analysis. Until just a few years ago, Egypt’s ruling military elite was able to “borrow” money from Egyptian banks with no intention of paying it back. President Hosni Mubarak’s son Gamal changed all that, reforming and privatizing the system in order to build an empire for himself. One of the many changes [Gamal] made was empowering the central bank to actually enforce underwriting standards at the banks. The effort began in 2004, and early estimates indicated that as many as one in four outstanding loans had no chance of repayment. By 2010 the system was largely reformed and privatized, and the military elite’s ability to tap the banks for “loans” had largely disappeared. The government was then able to step into that gap and tap the banks’ available capital to fund its budget deficit. In fact, it is this arrangement that allowed Egypt to weather the recent global financial crisis as well as it did. For the first time in centuries, Egypt’s financial position was not entirely dependent upon outside forces. From Gamal Mubarak’s point of view, four problems had been solved. The government had more stable financing capacity, the old military guard had been weakened, the banks were in better shape, and he was able to build his own corporate empire on the redirected financial flows in the process. But these changes and others like them earned the Mubarak family the military’s ire. Mubarak and his reform-minded son are out of the picture now, and the reform effort with them. With the constitution suspended, the parliament dissolved and military rule the order of the day, it stretches the mind to think that the central bank will be the singular institution that will retain any meaningful policy autonomy. If the generals take the banks back for themselves, Egypt will have no choice but to seek international funds to cover its budget shortfalls. Incidentally, we do not find it surprising that now — five days after the protests ended — the banks are still closed by order of the military government. Yet Egypt cannot simply tap international debt markets like a normal country. While its foreign debt load is small, its total debt levels are very similar to states that have faced default and/or bailout problems in the past. An 8-percent-of-GDP budget deficit and a 72-percent-of-GDP government debt load are teetering on the edge of what is sustainable. Based on all I've learned about Gamal I'd dispute that he undertook the reforms for the express purpose of building a personal financial empire. And in any event he would have needed all the financial empire he could muster in order to keep prying the Old Guard's fingers away from Egypt's throat. I also dispute Friedman's claim, in the February 14 report, that Hosni wanted his son to succeed him in the near term; see my Valentine's Day post for my reasons, although I won't plant a flag on that point. I'm willing to concede that the Old Guard might have had inside information that Gamal was going to make a try for the presidency in 2011. I'll even concede that there could have been two coups - the one I outlined, and the kind of ad hoc coup that Hendawi and Friedman described. I can see how the Old Guard, once noting the military was being hero-worshipped by the protestors, might have decided to throw Hosni to the lions just to make Double Dutch sure that Gamal had no more supporters in the regime -- even though Hosni made every concession the they wanted on January 29 by naming Old Guard champion Omar Suleiman as vice president and calling for the resignation of Egypt's Cabinet, thus ejecting the peskiest of the Gamalist economic reformers from government. But no matter how you slice and dice it the Old Guard had to act. If they didn't want to resort to a wave of assassinations to solve their Gamal problem their best window for action was the annual Police Day commemoration in Tahrir Square on January 25. Their biggest problem would have been persuading the April 6 Youth Movement leaders and other activist group leaders that if they mustered their followers to come out in full force to protest on Police Day, they wouldn't be targets of a sting operation to single out and neutralize opposition ahead of the presidential election. They managed to persuade them, but all that for another day. Hi Mister President Obama. Does your address to the nation tonight about Libya mention an al Qaeda-Benghazi tribes connection? Hah! I see Charles Krauthammer's practicing super-dexterity on FNC 6 PM news panel tonight. FNC's Glenn Beck was up in arms on his show this afternoon about reports of a connection between al Qaeda and the Benghazi tribes that are main beneficiary of the "International Community's" intervention in Libya. So Krauthammer told the news panel that the goal would be for the US to find and promote the moderate, non-Islamist, democratizing members of the rebel forces -- BUT that any connections between radicals/terrorists and the rebels would become an issue for the USA only IF and WHEN there's been regime change. How's about that for bailing water with one hand and threading a camel through a needle's eye with the other? Anyhow, I've mucked around in reports and speculations about the AQ-Benghazi tribes connection. The most exhaustive report, and the best researched and documented one, I've found is at Mathaba website, which on March 24 published a long version of the report that Webster G. Tarpley wrote for his website. I know Tarpley is always controversial but he is very good at gathering tons of useful data points in one writing. It's just at the interpretation and conclusion phase that he puts on his anti-imperialism agenda glasses and thus, often undercuts much of his painstaking research. And yes there is a pie chart and a graph and even a map, for readers who have trouble digesting data not presented in PowerPoint format. And the pdf link to the West Point study. It would be news to John Loftus that MI6 created the Muslim Brotherhood. My recollection of the data Loftus dug up from declassified DOJ documents is that MI6 helped the OSS (or maybe by that time it had become the CIA) identify Muslim Egyptians who would the fight the Godless commies for them. And I do well remember Loftus drolly adding that MI6 forgot to mention to their US counterparts just one little detail about the helpful Muslims they found: the Muslims were Nazis. Now I go fire up the popcorn maker in honor of President Obama's speech to the nation to explain how and why Americans got involved in Libya and how he plans to extricate the USA. The John Batchelor Show has been closely following the situation. Below is John's most recent post at his website on the still-unfolding crisis. See the website for links and photos included in the post. Sudden darkening news from Fukushima includes a Reuters flash, now backed by a BBC report, that the water at Unit #2 is up to 10 million times normal, and that the workers must be evacuated. This is not a positive development after anecdote for the last days of workers damaged by radiation from working in water. The Japanese government has aleady estimated the quake and tsunami and reactor disaster to cost over $300 Billion. The puzzle remains if it can be contained. The reports for several days have pointed to Unit #3 as the problem. Unit #2 (below, #2 control room as they restored lights) was not featured for several days and was presumed solved. The evacuation zone outside of Fukushima continues to grow, with a quarter of a million already evacuated and the red line spreading into Fukushima Prefecture. The challenge is how to measure the TEPCO failure at Fukushima. The reminder is that this is said to be a 60% man-made crisis caused by TEPCO's denial, arrogance, delay and deception in the first critical hours. A strange victim, of many more to come, is Angela Merkel, who is now slated to lose a bi-election in Baden-Wurtemberg because she reversed course on nukes in Germany. The Germans have only 17 reactors, and they have closed the 7 most like Fukushima for the short-term. The Greens are rallying voters to the no-nuke cause. It is coming the US way, and we have 104 reactors, with four on fault zones and more than twenty like the light-water reactors at Fukushima. The ongoing crisis at Fukushima will weaken the nuke forces in all hemispheres. Worse, TEPCO is now baldly revealed as untrustworthy, and this case will spoil all trust of nuke operators. This post follows on the March 19 and March 25 posts. The "major window" Berkland cited was between March 19 and 26. It's now 3:37 Pacific Time on Sunday morning, the 27th. There was a small earthquake on the 26th in Baja California, Mexico, which is on the Mexico-California border. While the quake was technically not in California I suppose diehard supporters of Berkland's earthquake prediction model would say that it counts. Yet my understanding of Berkland's prediction is that it was specific to a major earthquake in California. If it should turn out that the small quake was a precursor to a major one in California during the coming week, then I'd say the quake on the 26th conceivably breathed oxygen into Berkland's model. And it's always possible that a part of the model, if hooked up with other factors, could generate predictions that are accurate and consistent enough to rule out chance. As it stands now, however, Berkland needs to go back to the drawing board. I wish him luck in the endeavor; anyone who makes it a calling to attempt to predict earthquakes deserves thanks, not derision. A small earthquake struck Baja California on Saturday afternoon, but there were no reports of damage or injuries, according to the U.S. Geological Survey. The magnitude 3.6 tremor occurred around noon, with its epicenter about 32 miles south-southeast of Calexico, Calif., and Mexicali, Mexico, on the U.S.- Mexico border, said Leslie Gordon, a spokeswoman for the U.S. Geological Survey, which reports and monitors earthquakes. Gordon said that the quake was felt “very weakly” in Calexico, Mexicali and El Centro, Calif., and that there was no reports of it being felt in San Diego, about 100 miles west. "What I call a seismic window, this top seismic window in years, is developing between the 19th and 26th of this month." I suppose I should try to find the interview to double check but for now -- if the CBN quote is correct, that would extend the window one day beyond the day -- today -- that Natural News gave for his prediction, and which I quoted in my last post. Berkland correctly predicted the 1989 quake that hit California during the World Series in the San Francisco Bay area. He told Fox News that some of the same signs that preceded that quake have shown up again. He warned that the moon will be very close to the earth, which will increase tidal forces. Also, he said animal behavior, such as the recent fish deaths, is indicating a change in the earth's magnetic field, which often happens before a quake. "But I'm saying we just had a massive fish kill," he said. "Maybe a million fish died in Redondo Beach. They had a massive fish sweep in Mexico. We just had a bunch of whales come in close to San Diego." "I used to just scoff at these kinds of things, because I was a mainstream geologist until I found out that earthquakes are fitting a pattern," Berkland explained. "The big earthquake in the Indian Ocean followed massive beachings of whales in Taiwan -- not Taiwan, but New Zealand and Australia and Tasmania. And then within couple of days, they had a 8.3 in south of New Zealand, and then came the 9.1 in the Indian Ocean, with the big tsunami, on the very day of the full moon." "The previous big quake and tsunami was in Alaska, which is a 9.2 magnitude event, on the day off the full moon, on the 27th of March," he added. As the Natural News article noted, Berkland's prediction model for a California quake references not one but four factors: the spring equinox and recent clockwise earthquake activity along the Pacific Ring of Fire in addition to unexplained marine life deaths and the supermoon at perigee. So far the only major quake within the March 19-26 window that Berkland identified has been in Burma, on March 24; that was a 6.8 magnitude according to the USGS. Burma's government put the magnitude at 7.0 but the USGS readings are considered the worldwide standard for quake measurement. A question would be whether any of the variables Berkland uses for earthquake prediction might apply to the Burma quake. The last entry on Berkland's website about earthquake activity is from June 2010. So it seems one would have to sign up for his newsletter to receive whatever comments he might have about the Burma quake and any additional comments he's made about his California earthquake prediction since giving the interview at FNC. There was also a 6.6 magnitude quake off the east coast of Honshu, Japan on March 22, which puts it within the time frame Berkland identified for a major California quake. But I'm assuming the Honshu quake was one of the many aftershocks from the March 11 earthquake in Japan, which is officially named the Tōhoku quake. The Tōhoku was so powerful that its aftershocks can continue for months and even years. Wikipedia notes that China's Yunnan quake on March 10, which was overshadowed by the Tōhoku one, was near the Burmese border and that "Small tremors had been occurring in this region for two months ..."
Yangon, Myanmar — A strong earthquake struck northeastern Myanmar late [Thursday]shaking buildings as far away as Bangkok. No tsunami was generated. The quake struck along Myanmar's borders with Thailand and Laos, about 70 miles (110 kilometers) from Chiang Rai. The northern Thai city sustained a little damage, according to Thai television. The 6.8-magnitude quake was just six miles deep, according to the U.S. Geological Survey. At that strength and depth, the monitor said 600,000 people got shaking anywhere from strong to violent and that the buildings are considered vulnerable, so moderate to very heavy damage is expected in homes. Buildings swayed in Bangkok, about 480 miles south of the epicenter. The Pacific Tsunami Warning Center says [the quake] was located too far inland to create a destructive wave. The shallow earthquake occurred in northeastern Myanmar, on a geologically active area east of the subduction zone between the Indo-Australian Plate and Eurasian Plate, which created the Arakan Yoma mountains. The earthquake was triggered near fault lines extending from the Yunnan-Guizhou Plateau toward central Thailand, apart from the main seismic zones in central and western Myanmar. Other recent significant earthquakes in this area included the 2011 Yunnan earthquake and the 2007 Laos earthquake. [...] Did [Berkland] mention where in the 163,696 sq. miles of California it will hit? No one knew about the Northridge fault, let alone predicted the earthquake! I wonder how many "super perigee moons" there have been since 1906. Yes, well, as I mentioned in the last post, an astronomer has done a good job of debunking claims of a cause-and-effect connection between full moons and earthquakes. But again, Berkland is viewing the pull of a regular full moon and/or supermoon perigee on the earth's oceanic tides as one factor in the timing of major earthquakes. [...] Giampaolo Giuliani, a researcher at the National Physical Laboratory of Gran Sasso, based his forecast on emissions of radon gas coming from the ground in seismically active areas. The first tremors in the region were felt in mid-January and continued at regular intervals, leading to concerns that a large earthquake was imminent in the medieval city. Vans with loudspeakers had driven around the town a month ago telling locals to evacuate their houses after Giuliani predicted the quake was about to strike. The scientists' warnings drew criticism from the city's mayor, and following complaints to the police, Giuliani was forced to take down warnings he had posted on the internet. Italy's major risks committee met on 31 March to reassure the city's population that the seismic activity was nothing to be alarmed about. "The tremors being felt by the population are part of a typical sequence [which is] absolutely normal in a seismic area like the one around L'Aquila," the civil protection agency said in a statement that evening. Predicting earthquakes based on radon emissions has been studied by scientists since the 1970s, but enthusiasm for it had faded due to inconsistent results. In December 2009, Giuliani presented his research, without many important details, to the American Geophysical Union in San Francisco; the union subsequently invited him to take part in developing a worldwide seismic early warning system. On his return home, the Italian authorities lifted the gagging injunctions against his predictions. More recently , Italian geologists and officials have been indicted for manslaughter for not predicting the 2009 L'Aquila earthquake. The article doesn't mention how the indictments turned out; I'd be surprised if the accusations even made it to trial. The earthquake was felt throughout central Italy; 308 people are known to have died, making this the deadliest earthquake to hit Italy since the 1980 Irpinia earthquake. The quake measured 6.3 on the moment magnitude scale (MMS), which has superseded the Richter scale for measuring earthquake activity. The Richter reading for the quake was 5.8. It seems the Natural News article (see below) gave the wrong date for the window of opportunity that Jim Berkland named for a major earthquake to strike California. According to an article I saw today that quotes Berkland, the window is from March 19 to 26, not March 25th. See my post today for details. A supermoon is so named because the moon's orbit occasionally takes it closer than normal to the earth at the time of perigee; i.e., moon's shortest distance from the earth during the lunar cycle. See this article at National Geographic Daily News page for a crash course on the March 19 supermoon, which came closest to the earth in 18 years, and for an explanation about why it could look pretty much the same to the naked eye as a normal full moon (notwithstanding the awe-inspiring moment that Trujillo captured). The author of the Geographic piece also takes a swat at claims that supermoons can precipitate earthquakes and tsunamis. Yet it was an ordinarily good-natured astronomer named Phil Plait who pulverized the claims in a March 11 post at Discovery magazine. That wasn't the first time Plait had explained why the idea of a supermoon-earthquake connection was nonsense, but he was so exasperated by a (U.K.) Daily Mail scare piece on the connection between the moon and Japan's earthquake that he put on the hobnail boots. The result is one of those articles that are worth saving and passing on to your grandchildren. However comma debunking the supermoon connection will not dissuade humanity from its quest to seek signs and portents that warn of an earthquake. One seeker is Jim Berkland, a retired geologist who claims to have developed a set of indicators that can predict major earthquakes. Other scientists have disputed Berkland's methods and the success rate he attributes to his method. Yet this hasn't dampened the general public's interest in his approach to earthquake prediction, perhaps because it feels intuitively correct: not by any one sign but by a particular convergence of these might a warning of the earth's upheaval reveal itself. Intuitive reasoning, as mathematicians delight in demonstrating, can be spectacularly wrong. Yet there is a difference between perking an ear for intuition's whispers and the intuitive reasoning that keeps casinos raking in profits. And when one considers that 30 seconds is the most warning that even cutting-edge technology can provide for a tsunami that strikes land nearest an earthquake, it's not a fool's quest to sound every nook and cranny of intuition and to scan heaven and earth for signs and portents. Jim Berkland has taken just such an approach in formulating his latest prediction, which is that between March 19 and March 25 a major earthquake will strike California. First, the moon will be full and at its closest point to the earth during that time, a factor associated with previous earthquakes. Second, the spring equinox occurs during this time, producing some of the highest tides of the year. Third, the recent massive and unexplained fish die-off in Southern California could signal a magnetic shift that affects animals with unusual behavior. For example, beached whales have preceded previous earthquakes in California. And fourth, the Pacific Rim faults, known as the Ring of Fire, have experienced three recent quakes -- in Chile, New Zealand, and Japan. These earthquakes have proceeded in a clockwise direction, possibly indicating that the fault lines in California are next. With regard to the name of Berkland's website, I might have noted before on this blog that astronomical syzygy as an earthquake predictor has been roundly criticized by other scientists. And I think that with little effort one can find on the internet people who have gone to some trouble to critique every one of the signs that Berkland uses in earthquake prediction; e.g., not every instance of mass deaths of marine life can be tagged to an earthquake. But again, Berkland's method doesn't depend exclusively on syzygy or any one event. We'll learn, soon enough, if in this particular instance he's hit on a gestalt worth a closer look from his critics. And I note that the American Pacific Northwest (and southern British Columbia in Canada) are also situated along the Ring of Fire, so if the quake occurs as predicted it wouldn't necessarily strike in California. In any event, a major earthquake in California could immediately unleash a tsunami against the coastlines of Washington and Oregon states as well as California's. And conceivably a major quake could effect the Cascade Volcanic Arc, a part of the Pacific Ring of Fire and Cascade Mountains that includes over 160 active volcanoes. As we saw with Japan, which not only has cutting-edge tsunami warning devices but also a system unmatched elsewhere for instantly communicating the warning to the general populace, much can be accomplished with a warning of only 30 seconds. It's enough time to halt trains and factory machinery, allow drivers to make U-turns and the spryest to sprint for highest ground. But when one considers that the super-tsunami that struck Japan roared inland as far as an astounding six miles, I'd say this isn't the time to take only a purely academic interest in whether Berkland's prediction pans out. Of course one cannot live on pins and needles all the time. But then it's only once in a long while that the kind of convergence Berkland talks about occurs. So between now and the end of this month (I'd tack a few days onto Berkland's prediction to be on the safe side) I'd say this is the time for Americans and Canadians living along the Ring of Fire to pay special attention to the behavior of their pets and neighborhood wildlife and to focus more inward, on the "still small voice" than on the passing show. And, of course, to review emergency disaster preparations. As I noted in the noon update to the Chaos post, which went up at 3:30 AM ET today, trying to keep up with the machinations of the "International Community" and Gadhafi is like trying to play chess with a jackrabbit. Libya’s government announced an immediate cease-fire on March 18, a day after the U.N. Security Council approved a no-fly zone over the North African country. The move complicates European efforts to spearhead a campaign against Libyan government troops. Assuming Tripoli follows through on its declaration, the affect on operations against the Libyan rebels remains in question. The Libyan declaration comes as members of the NATO military alliance were ramping up for airstrikes authorized by the United Nations against troops loyal to Moammar Gadhafi. French diplomatic sources have been quoted as saying airstrikes could start “within hours.” Libya’s move potentially throws a wrench in plans to establish and enforce a no-fly zone — and take additional military action — against the Gadhafi government. France and the United Kingdom have led the international community in its push to intervene in Libya. Washington had signaled that it would let the European nations lead. Italy, formerly a strong Gadhafi supporter, announced March 18 that it would consider supplying aircraft to the intervention, as did Norway, Denmark and Belgium. By offering a cease-fire and inviting nongovernmental groups to conduct fact-finding missions, however, Gadhafi is betting that the European nations will lose the political justification for an attack and that political disagreements over military action within European nations can further weaken their already weak resolve. Europeans in general are war-weary from their involvement in NATO’s operations in Afghanistan. They only will support an intervention in Libya if Gadhafi clearly is committing gross violations of human rights. It will be difficult for Paris and London to prove that Gadhafi is indeed committing such acts or to ignore the cease-fire announcement or the invitation to verify it. The immediate reply from France was that it would deal with the cease-fire declaration with caution and that the threat on the ground was unchanged. But the backlash at home against an intervention in light of Gadhafi’s comments is not something European governments can overlook easily, especially since the most powerful EU member state, Germany, already has buckled under the domestic political strain and expressed skepticism toward a military operation. Assuming Gadhafi follows through with the cease-fire, how it will affect his operations against the rebels remains in question. Gadhafi may feel the rebels have been suppressed such that he can mop up the remainder through police actions in urban settings. Alternatively, he may feel the rebels are so thoroughly entrenched in their stronghold of Benghazi that he cannot dislodge them under the threat of Western airstrikes — and is therefore cutting his losses and preserving the integrity of his forces from potential Franco-British-American air attacks. Ultimately, the cease-fire could be a delaying action while Gadhafi builds a stronger position around Benghazi. This would not be without risks, however, as it will give French and British air assets time to deploy in air bases in the Mediterranean, better positioning them to enforce a no-fly zone. That said, the Security Council has authorized a no-fly zone, which means that while assaulting Gadhafi’s ground forces directly may be stalled by the cease-fire statement, establishing a no-fly zone is not. 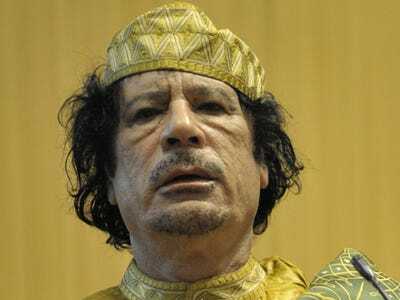 It is also likely that Europeans will respond to the statement with further demands on Gadhafi, such as that he must resign as leader of the country or that he must withdraw his troops from eastern Libya and possibly even other cities in the west that have seen fierce resistance, like Misurata and Zawiya. Both of these demands would be difficult for Gadhafi to accept. The establishment and enforcement of the no-fly zone may still go ahead, but attacking Gadhafi’s forces directly will become difficult in the immediate term. I give up. Following the Libya situation on a daily basis is like trying to play chess with a jackrabbit. Now that the "International Community" has declared war on Gadhafi it looks as if he's yanked the offer to let the few hundred rebels that are left to fight to surrender or leave Benghazi in peace (and be picked off later in the desert). The idea behind the offer was to spare the key city, but with Gadhafi now racing against the "International Community," it's doubtful he'll attempt to spare noncombatant civilian lives in the push to retake Benghazi. The news from Manama, the capital of the small island state of Bahrain, is that the Fifth Fleet HQ has gone on maneuvers to Oman for an indefinite time frame. In sum, bug out from the proxy war in Bahrain between Riyadh and Tehran. Am told that the IRGC has staffed and funded the so-called protesters. The social media messaging that now floods the web, #bahrain, is suspect of being an IRGC disinformation campaign. Of most significance, am told the Bahrain confrontation marks the breakdown of the 65 year-long alliance between Washington and Riyadh. The Kingdom has now turned away. China through the Pakistan connection looks like the choice to replace the US. Spoke Barry Rubin, GLORIA, to learn that Egypt is also tumbling away from the US. Pat Lang, Sic Semper Tyrannis, said that Cairo is looking for another sponsor. What has caused this break between Washington and its allies in the Middle East? Am told that the White House is deaf to experienced diplomats in the region. That the White House is piously ideological in supporting so-called democratic leaning youth protesters despite the evidence that the "yuppie bloggers" are either naive ideologues themselves, without experience in governance or diplomacy, or they are tools of the anarchists, Islamists and Twelvers. Asked Barry Rubin if the US is on the brink of losing Egypt. Answer: over the brink. Asked Pat Lang if there was any repairing the break with Riyadh. Answer: no. Er , how did conversation go from no-fly zone to bombing tanks and heavy artillery? Well, our butts weren't saved for long. So let me see if I understand this correctly. Everyone fiddled around until it looked as if Benghazi would fall to Gadhafi, then Americans were backed into another war. Looks like we didn't get rid of the British for very long, either. I guess the Atlanticists won't be happy until Americans have lost their shirts fighting for 'Atlantic' interests. And here I thought Obama had grown some spine. Me, I'm going to start praying for the return of George Washington. From Youtube, and reported @AJELive #Bahrain Police shooting in Sitra this morning: what looks to be a handful of militia in a rough part of town, with graffiti on the walls, few cars, certainly not uniformed police authority, moving backward from unseen shouting. Two or more shots ring out, unclear from where, and then one of the militia fires a round. Spoke Pat Pang and Larry Johnson, Tuesday 15, who tell me that Riyadh has broken off communication with Washington re Bahrain. David Sanger, NYT, tells me that the first time the White House knew of the Saudi troops rolling over the causeway to Bahrain was when it saw it on the news. Pat Lang says this is a major turn in the road, an unprecedented breakdown. Pat Lang and Larry Johnson and I speculated who the Saudis will task for military cover in the Gulf if they are shedding the US. China is the guess. The Saudis have quit the Obama administration as an ally. The deteriorating started with the Mubarak fiasco of late January and now continues through the [Gadhafi] fiasco of March. The Bahrain event, the imminent brutality, the distrust and disdain by Riyadh for Washington, all signs point to bloodymindedness in the Gulf. There is a proxy war between Riyadh and Tehran, and the US is out of the fight. Am reporting now that the Bahrain riot police backed up by tanks [as] the Saudi troops are moving now on the protesters camped out in the open in Manama, using tear-gas and brute force. The US is out of the fight? Where is my Kleenex box? I disagree, unless Obama wants to do the right kind of leading: Get out there and shout from a mountaintop, "Drill drill drill!" But by a funny coincidence, the last time Americans got really serious about weaning themselves from foreign oil -- in 2008 -- which drove down the price of OPEC oil, there was a sudden catastrophe in the global financial markets, the genesis of which was never, ever quite fully explained. Absent Obama saying that every American homeowner should start drilling for oil in the back yard, he's doing the right thing by being too preoccupied to play slave to squabbling oil kingdoms. Yes of course there will be suffering for Americans if we seriously cross the Saudis and OPEC. But if there was ever a time to be inspired to take courage, all we have to do is look at how the Japanese are meeting suffering. Donald Trump said recently that if he were U.S. President he'd make other nations respect us again. No. There can be no respect from others if we don't first respect ourselves. No man can bestow self-respect on others. This is something we have to do ourselves. U.S. Ambassador to the United Nations Susan Rice said late Wednesday Washington wants the resolution to authorize a broad range of actions that include - and "perhaps go beyond" - a no-fly zone. France, one of the sponsors of the draft resolution, sent its foreign minister to New York Thursday to try to secure a quick approval of the resolution. Meanwhile the armed forces under Gadhafi are still on a fast march (see the VOA link above), although they've said they'll call a hiatus on Sunday to give the rebels time to surrender. I understand that the French government is gravely concerned that France will be overrun by Libyan refugees if Gadhafi isn't quashed. It's a valid concern but if they were all that alarmed, they should have hung back to see how Gadhafi played his hand before they rushed to recognize the revolutionary 'government.' So now France is all the way out on limb, and now they hearing a sawing sound coming from Tripoli. That's unfortunate. What's even more unfortunate is that Japan's crisis might mean they can't continue being the second largest buyer of U.S. treasury bills and bonds (the Federal Reserve is the first). The Japanese people finance their government's debt but now they're also going to have to finance the rebuilding of a large swath of their country. What this means for the USA in the near term is that it can't to afford to get embroiled in another open-ended war. We owe it to the Afghans -- and the Iraqis -- to finish what we started, which is a big enough financial drain. We cannot and should not ask China's government to pick up whatever shortfall comes from Japan's financing in order to bankroll our engagement in another hot war. So if the British and French want to establish a no-fly zone, they can go right ahead. If they want to arm the rebels with heavy weapons and put military advisors on the ground, go for it. If they want to send troops in, fine. But by God, for Americans the battle cry of this century must be, "America is not the maid!" Memo to the entire world: From here on, if you want Americans to do the dirty work then we get absolute authority, as we had in Germany and Japan at the end of World War Two, to dictate how a new government conducts itself after we've overthrown the old one. You can't find more civilized societies than the German and Japanese ones. So the American exercise in true imperialism worked out very well. Since, however, we've been conducting faux imperialism. This has translated into putting our military in the role of The Maid -- and our foreign office in the role of the CIA, as State pussyfoots around the world with USAID in tow, sowing phony democracy revolutions then shrieking for The Maid when its scheming and plotting blows up. And thus, we find ourselves today in the poetic position of depending on the Germans to think straight for the United States of America. This has saved us from being dragged into a civil war, in which our only right would be to pretend that the scoundrels we rescued from Gadhafi were dealing honorably with us. I caution that we're not out of the woods yet. There's no end to the machinations of State and critters such as Senator John McCain. Yesterday McCain teamed with Senator Joseph Lieberman to introduce a Senate resolution calling for prompt U.S. intervention in Libya, including recognizing the rebel 'government' and establishing a no-fly zone. And there is a faction in Washington that's trying to make political hay from President Barack Obama's dislike for playing Beulah every time the Europeans in NATO snap their fingers. And while he's previously shown an ability to resist pressure from Britain and France he tends to govern by popularity polling. So if McCain et al. can whip up enough support among the American voting public for U.S. intervention, Obama might cave in, despite the advice from his secretary of defense to stay out of fray. Before I return to finishing up part 2 of the Optical Illusion post, I should mention there have been big developments on the military front in Libya. See this report from Associated Press. Gadhafi is creaming the opposition, and he's now being lavish in the use of air power. 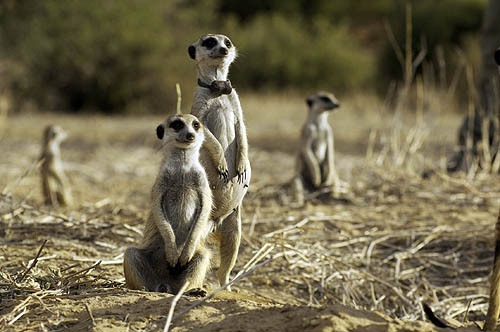 He's also taken a page from the meerkat clans of the Kalahari Desert, who shoo poison snakes from their burrows by surrounding the snake in a wide circle, leaving an opening in the circle, then (carefully) harrying the snake until it takes the hint and leaves. As it stands now that's his plan for Benghazi, only he intends to pick off the rebels in the desert as they take the opening he leaves for them on the outskirts of the city. The plan will save many civilian lives and save Benghazi from being bombed to rubble. So I hope the rebels take the opening before Gadhafi closes the noose, and that they don't make Benghazi non-combatants into human shields. The rebel leaders should get out of Libya by any which way, right now, so they live to fight another day. Set up Radio Free Libya in Paris and study real hard on how to set up and run a truly democratic government. They should also stuff their ears with cotton and chant, 'Lalalalala we're not listening' if State approaches them with a plan for how to stage a really cool peaceful democratic revolution in Libya. With Moammar Gadhafi's easy rout of the rebels from Ras Lanouf and Brega it is now patently clear that from the first days of the unrest in Libya he played the fool; he did so long enough to lull the rebels, disloyal troops, and "international community" into overconfidence so they would reveal their intentions and tactics. It was a classic feint, brilliantly executed by a military man who knows exactly what it takes to mount a successful coup and maintain power. By the time the Arab League convened an emergency meeting on Saturday to half-heartedly add their weight to calls for a no-fly zone over Libya it was obvious that Gadhafi had never needed air support to disperse the rebels. On Sunday (Ret.) Lt. Gen. Thomas G. McInerney gave the old fox a back-handed compliment when he stonily told FNC's Geraldo Rivera that he'd go out on a limb with a prediction: Gadhafi wouldn't pull a Montgomery by waiting to reinforce his supply lines; instead he'd forge on to quickly retake Benghazi. Thinking hard and fast, Geraldo ventured, "You're saying he'll pull a Patton." But here is a mystery: The eastern part of Libya had never wanted Gadhafi's rule yet spent decades enduring it just because they knew Gadhafi was a formidable opponent who was expert at crushing rebellion. What, then, possessed the residents of Benghazi, the locus of anti-Gadhafi sentiment in eastern Libya, to embark on a rebellion formed of a motley collection of army deserters, and of civilians whose knowledge of military maneuvers was pretty much limited to firing automatic weapons? While I'm in a questioning mood: And what possessed supposedly well-informed political leaders in the USA and around the world to publicly encourage a rebellion that reason told didn't stand a chance of succeeding without a full-scale foreign military intervention? I can think of one answer that would cover both questions, which I'll discuss in the next post. First, I want to thank readers who wrote to express sympathy and support. Second, I'm okay. Third, things have settled to the point where I'm hoping to write and publish one and possibly two posts this weekend. There's been a family emergency. I don't know when I'll post next but I'll check in again on Friday the 11th.